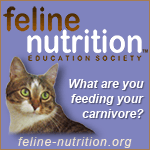 Cat expert Sally E. Bahner has more than 30 years experience as a writer and editor and has spent the last 15 years specializing in feline-related issues, specifically nutrition, holistic care and multiple cat behaviors. More recently she has offered services as a feline behavior and care consultant and speaker. As “Dear Sally” she is the resident behavior expert on Tracie Hotchner’s Cat Chat on Sirius Satellite Radio’s Martha Stewart Living Channel. She is a regular contributor to the online newspaper, the Branford Eagle. In addition, she was the cat expert and a regular contributor for Pets Press, a Connecticut-based pet newspaper. The founding editor-in-chief of The Whole Cat Journal, Sally has contributed to Feline Wellness, Catnip, and Catwatch. She has been a columnist for several newspapers along the Connecticut shoreline since 1997. 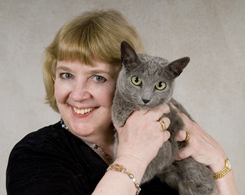 She is an award-winning member of the Cat Writers’ Association and a member of the International Association of Animal Behavior Consultants. She can be reached at sebahner@snet.net. Hi Sally! Not sure you’ll remember me from HES days – but I ran across this blog looking for info on getting a Savanah cat and then what a surprise recognizing you! I had to say hello. So, since I’ve got your ear, what are your comments on Savanah cats — I’m thinking F3. Would LOVE to hear from you. Want to reconnect with you – met you back in the Belvior days. I have a new very exciting startup called vetDVM – with an iPhone and iPad app and soon Blackberry. Hey Sally! Great seeing this blog. Fellow RB lovers unite! Do you know about the Cat Blogosphere? Great community of blogging cats and their people- LOL! Hope to see more on your blog. Drop by the cat Blogosphere when you have time. Thought you’d like to know that I added the Cat Blogosphere to my blogroll. Cute stuff, and adorable Russian Blues — they’re the best! We are building a community centered around sharing and captioning cat photos with other cat lovers.